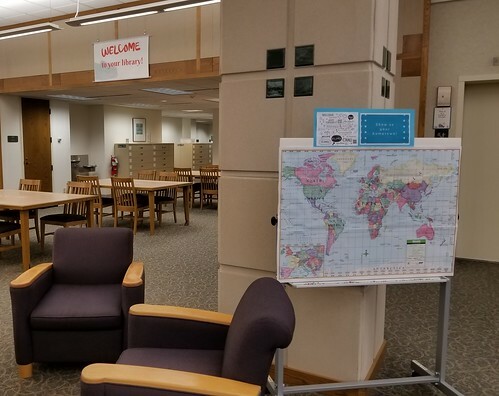 In this entry from 2014, Lawrence student (now alumnus) and library fan William Gislason took the time to write another excellent post for our blog. Here, he imparted some wisdom he’d gained about the Mudd Library after he had spent much of his summer here in a student office. The summer before my senior year, I got to know Lawrence University’s Mudd Library on a whole new level. Amazingly, Lawrence hired me to build an iPad app for the trails of Björklunden— that’s right, sometimes Lawrence actually pays you! Along with the job, I got an office of my very own in the Seeley G. Mudd Library. After spending day after day in it, I’ve learned a thing or two about this building and I’ve come to realize that our library is actually one of the best places on campus! Here’s a list of 5 things I wish I knew about our library when I was a freshman. Whether you want to hang out with friends surrounded by the hustle and bustle of the first floor or have some peace and quiet on the fourth floor — there’s a spot for you. When serious work needs to be done on a paper, check out the study carrels along the windows of the silent third and fourth floors. When you need to meet with a group, try reserving the meeting rooms on the second and third floors (fully equipped with all you need to practice a presentation or write out a complex differential equation). Of course, if you just want to meet up with some friends while getting this week’s Italian homework out of the way, there are plenty of large group tables throughout the first and second floors always littered with groups of laughing students. Anyone who thinks the Mudd Library is only filled with books is missing out. Every student has access to thousands of albums – new and old. You want The Beatles? They’ve got The Beatles. You’ll graduate long before you have a chance to listen to half the free music you’ve checked out. Of course, you can’t forget about the movies. When you and your “LUMOS” friends (Lawrence University’s Magical Organization of Students) decide you need to watch all 8 Harry Potter movies over Reading Period, you know where to go. And did I mention the viewing rooms? Let’s say you need to watch 2001, A Space Odyssey for your Film Studies class. You can actually check it out from the library and watch it away from the distractions of campus on a big screen TV! I’ll bet you didn’t know that Lawrence University has an Abraham Lincoln themed room where anyone can go to study and keep a bronze bust of Honest Abe company. How about an antique room devoted to the legacy of Milwaukee-Downer College that is filled with ancient books that bears an eerie resemblance to the library in Hogwarts (particularly after your Reading Period binge). And did you know about a small bare white room called the Mudd Gallery that serves as a pop-up gallery for a diverse array of art student’s projects. Within a week, the room will switch from delightful exhibit on typography to a grungy cavern showing beautiful, yet slightly disturbing, music videos for some of our campus’s rock bands on repeat. All of these room exist in Mudd Library and are open to students for study, contemplation, or artistic expression. The library is always filled with a plethora of librarians and student workers who love books. Each worker is surrounded by all genres of books and is bursting with recommendations about any subject. Looking for a collection of short stories? They just read a great one! How about a World War Two memoir? Their friend just recommended one. A book on how to write html/css code? They can show you exactly where all your options are. 5. The best part of the Mudd Library: FREE BOOKS! Do you realize that throughout your four years at Lawrence you will never have to pay for a book? Aside from some classes’ mandatory textbooks, any book you want is free! Think of the possibilities! Even if the unthinkable happens and they don’t have the exact book you want, you can easily order it through Interlibrary Loan. Currently, I have checked out a book on the ecology of Door County, a book on Wisconsin’s geography, the film Wild Strawberries by Ingmar Bergman, and the novel A Portrait of the Artist as a Young Man by James Joyce (if you are also a Joyce fan, don’t worry, they have 3 more copies). The Mudd Library can easily become anything you need it to be: a quiet study carrel, a meeting spot for friends, the hub of your cultural pursuits, or a home away from home. My best advice is to make full use of our library during your time at Lawrence. You’ll quickly understand why we all love it so much. Are you interested in writing a guest post? Contact Angela Vanden Elzen with ideas. Lawrence student and library fan William Gislason took the time to write another excellent post for our blog. 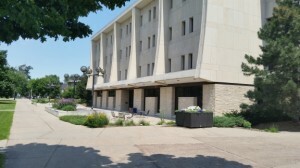 In this post, he imparts some wisdom he’s gained about the Mudd Library after spending much of his summer here in a student office. We have some fun events planned for new students and their parents during Welcome Week. Come to the library for any or all of these events, or just stop by to check out some novels, movies, or video games. The library will be open 8 a.m. to 4:30 p.m. during the week, 10 a.m to 4:30 p.m. on Saturday, and 11 a.m. to 4:30 p.m. on Sunday. Stop by our table to learn about the services the library offers our students, our collections, and meet some of our awesome staff. Parents, need a place to read the paper, get some coffee, and charge your phones? Stop by the library to relax and talk with the Mudd librarians about how we can help your students succeed. Come for the doughnuts and coffee, stay for the games, tours, library giveaways, crafts, and friendly librarians. We also have a mountain of prizes that were donated from downtown businesses. We’ve also put together an informative welcome page for new students to help you learn all about the Mudd Library. *We apologize to those of you who will now have the Frozen soundtrack stuck in your heads for the remainder of the day.